The House of Peace and Love provides luxury accommodations for budget travelers. This space will transport you into a hidden and magical southwest delight. The house is brimming with colors, amazing fabrics, contemporary folk art, fountains, eclectic furniture, and accessories from around the world. All the private rooms and common rooms take guests out into four private gardens that are behind twelve foot walls. The house has an indoor kitchen and outdoor kitchen, both fully stocked with china, glassware, cloth napkins, pots and pans. There are multiple intimate seating and dining areas in the gardens, as well as a hot tub and hammocks for guests to unwind, relax, renew, and restore. 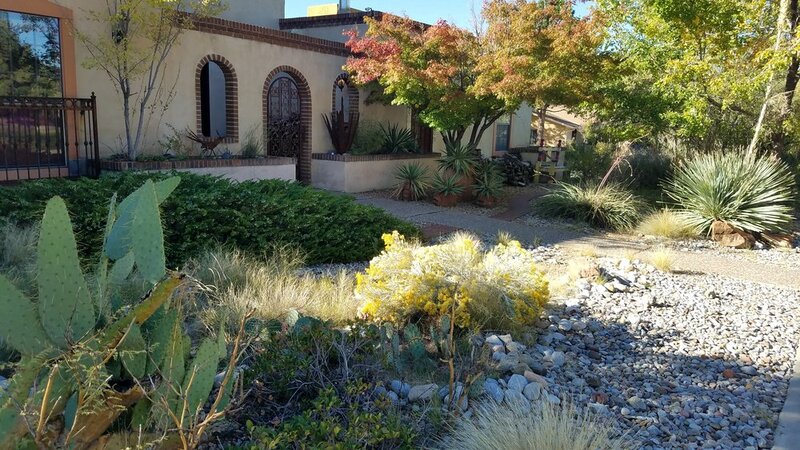 The House of Peace and Love is minutes away from the Sandia tramway; skiing, biking, and hiking trails; public golf; tennis; 24-hour movie house; dollar movie theater; and several grocery stores, including Whole Foods and Trader Joe’s. This area also boasts great restaurants for dining and boutiques for shopping. For family fun, we are also located near Cliff’s amusement park, Chuck-E-Cheese, and both iT’Z and Hinkle Family Fun Centers (laser tag, putt-putt, bowling etc.) For adults, the Sandia Casino is just down the street for gambling and concerts. The house is also ideally located for day trips to nearby attractions, just 45 minutes to the Plaza at Santa Fe and 70 minutes to Jemez hot springs.